Yesterday I attended a full-day session of a series of writing workshops that I had registered for. Even though the workshop was geared towards those teaching in English, there were many nuggets that I could take away as a teacher in a French Immersion class. The session gave me many ideas that I now have bouncing in my head. The best nuggets were the sample lessons the presenters did with us. The bonus was that they referred to the grade 1 and 2 curriculum. Perfect! Now I can implement these ideas. 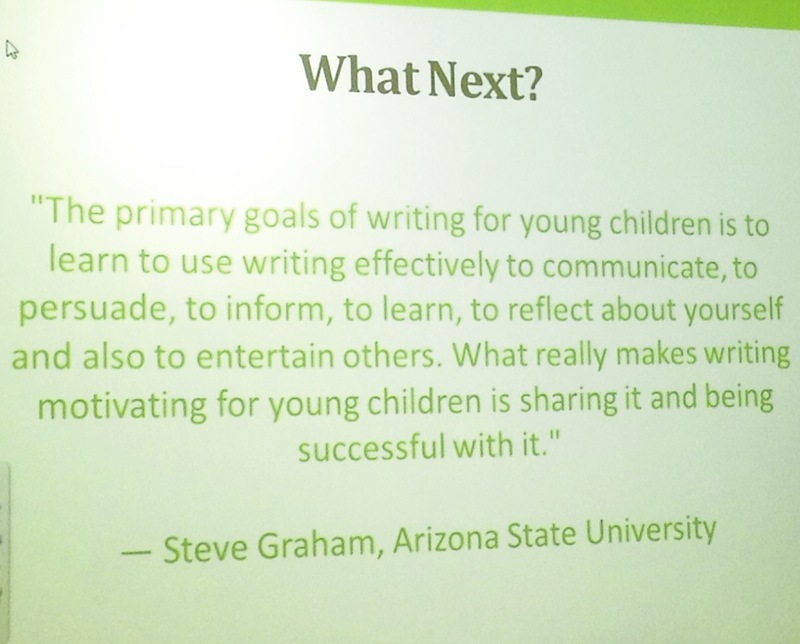 I loved the quote that the presenters shared with us midway through the session that suggested we should allow children to share what they have written and they will enjoy the experience. Yooung children enjoy sharing what they have done and not many will turn down the opportunity to do so. Their desire to share can be used to help them improve their writing with the use of adjectives, adverbs, synonyms and conjuctions. I have been wanting to work on this with my students and I am eager to follow the lesson plans that were shared with us yesterday. 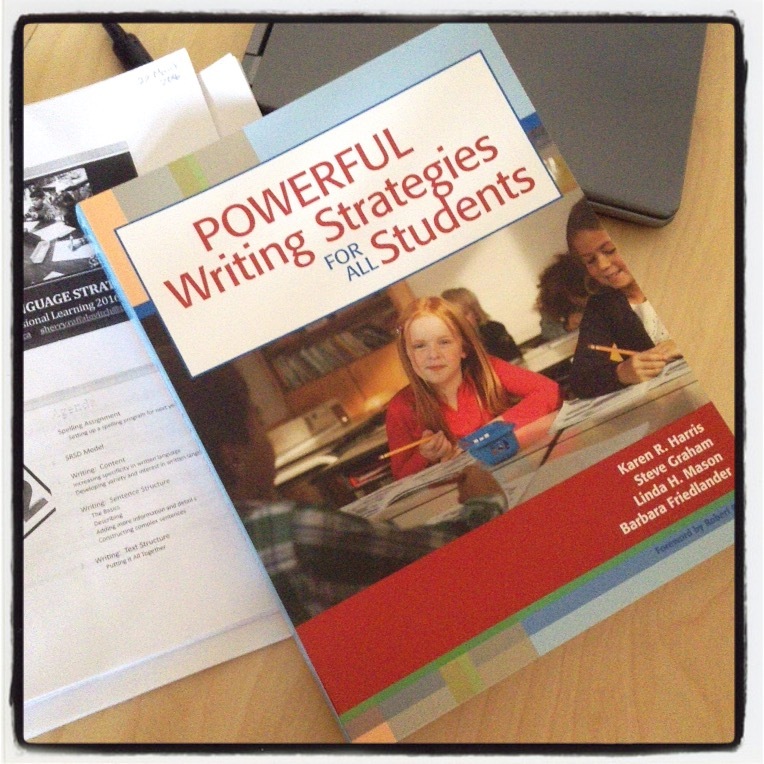 The session was the last of the series and ended with a gift: a copy of Powerful Writing Strategies for all Students was given to each teacher present. Paging through the book, I am excited to begin reading it. At 425 pages, it will probably only be read during the Summer but, in the meantime, I will use the index to refer to certain strategies I want to work on. This week I am grateful for the opportunity I have had to attend this series of workshops that have been created for the Beginning Teachers in the family of schools that I work in. I am grateful, as well, for the resource that I have received – a resource that looks to be extremely useful. I don’t know this model Annie. Can you tell me a little about how it works? I meant to respond but kept getting pulled away…. Workshop model is inquiry based. It’s about learning the elements of a project and then having the kids take ownership for it. Luci Caulkins has some fantastic books about teaching it with younger kids. Thank you for getting back to me Annie. I have now put her book on my reading list for the summer and will see how I can implement it in my French Immersion class. Enjoyed this post. I like the synopsis for writing and believe that it not applies to young students but adult students as well. Reading and writing was critical when I attended school and learning to present yourself effectively can never come too late. I am grateful that I can write and that this week has been one of delving deeper into the Word of God to clarify visions and plans. I have missed my blogging community much (had things to handle) and want to say I appreciate each blogger sharing. The pleasure is not only in the reading but also in the connection. Have a blessed day! I agree with you wholeheartedly. And if one can help children/adults enjoy writing, no matter what their age, you are on the positive path to helping them learn. I am grateful for the teachers in my life, and in my children’s and grandchildren’s lives, who, like you, are willing to go the extra mile. Thank you Michelle. As I was saying to my principal yesterday, I do want to do things right, and to give the children in my care the best learning experience that I can. That is very evident from all of your posts and the way you love the children you teach. I think it is important for kids to write and especially without using keyboards and touch screens. It’s becoming an increasing problem these days. Many parents told me that their young children are terrible at writing while they have no problem typing. I know that this is not the issue of your seminar, but still it just came to my mind that the kids should practice both writing as in composing their essays as well as writing using pens and pencils. Have a happy Easter, Colline. I only get Monday off, but will take a little break from blogging till next Thursday to relax. Providing children with opportunities to share their writing is essential. I am pleased (grateful) that this message is being heard by other teachers. Without an audience for their writing children can come to view it as a meaningless task, it’s only purpose being to please the teacher. It is good to provided audiences beyond their classmates too. That is so true. The children are so proud when I post their stories and illustrations on the board outside of the classroom for others to read.